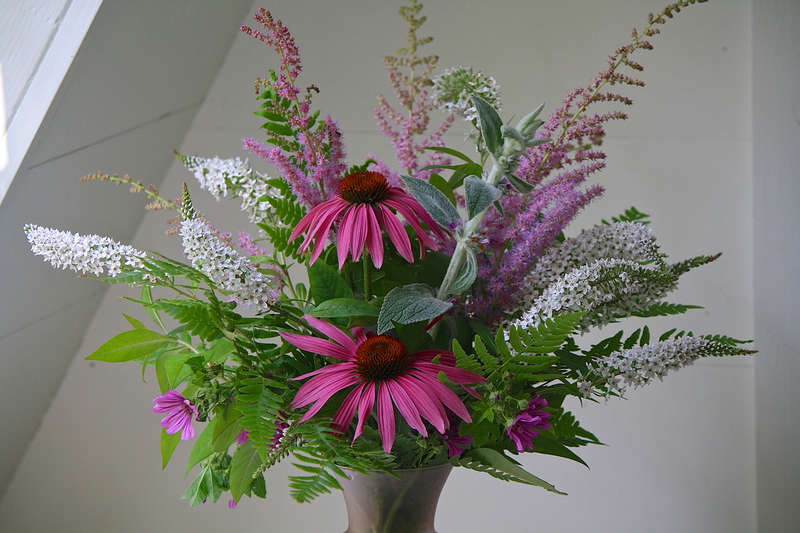 For this week’s vase, I used white gooseneck loosestrife (Lysimachia clethroides), along with pink astilbe (A. chinensis var. taquetii) and a couple of the last of the lamb’s ears flowers (Stachys byzantina) for vertical appeal. 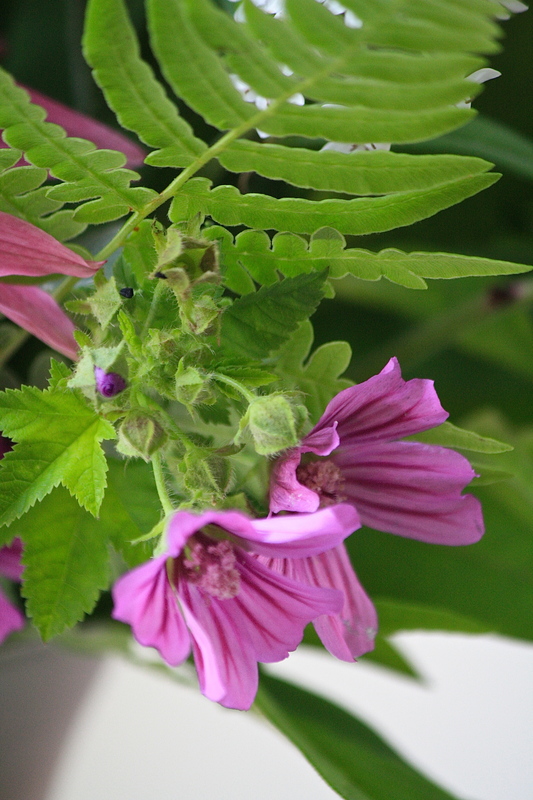 Purple coneflower (Echinacea purpurea) provide focal points with stems of striped mallow (Malva sylvestris ‘Brave Heart’) adding additional points of pink. Bracken fern (Pteridium aquilinum) provides greenery in a soft pink, frosted glass vase set on a tea towel printed with pink thistles. This entry was posted in Country Gardening, My Photos and tagged Astilbe chinensis var. 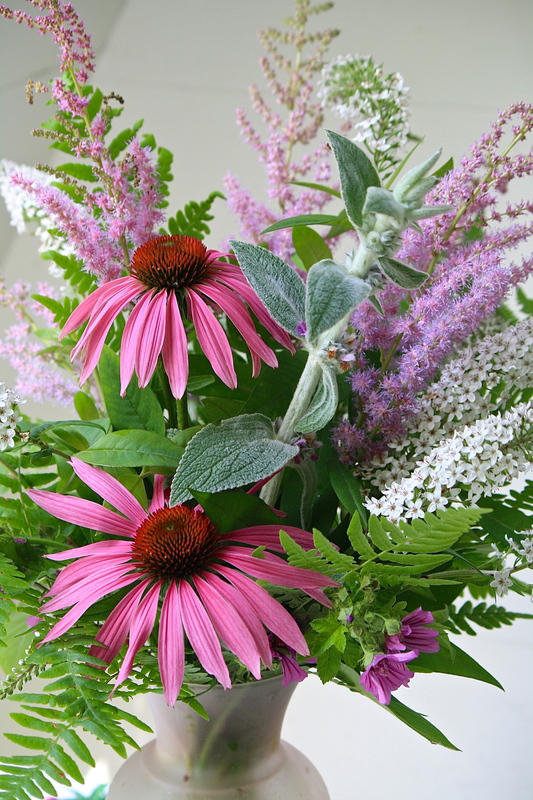 taquetti, echinacea purpurea, flower arrangement, flowers, gardening, gardens, gooseneck loosestrife, In a Vase on Monday, Lysimachia clethroides, Malva sylvestris 'Brave Heart', meme, photography, Purple coneflower, Weekly Vase Challenge. Bookmark the permalink. Thank you so much, Sarah. Hope your week is wonderful! Lovely. 🙂 My pink coneflowers are blooming right now too but I don’t have any white gooseneck loosestrife. I went on a Maine garden tour Saturday and saw many gardeners using it to its full advantage. Thanks, Judy. Gooseneck is pretty & long-lasting in the garden & the vase (these were actually recycled from last week!). Given its own space, it puts on quite the show. Like artemisia and mint, it can get out of hand if we don’t keep it curbed. I think it is worth the effort! So so pretty! I will miss all my astilbe. It’s so nice that you give yourself flowers every week and share them with us. Thank you. You are such an artist! 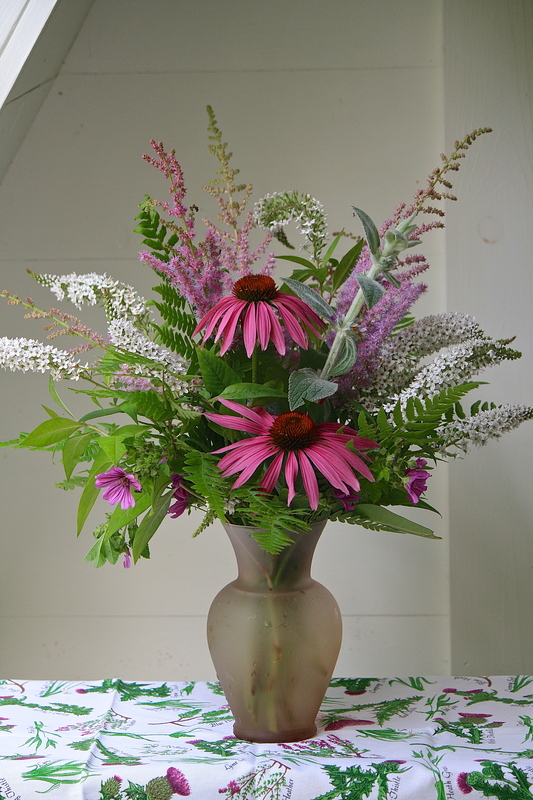 Another stunner Eliza:) The pink astilbe is just flowering with us too but the Echinacea is a way off. Our cool wet summer is probably not suiting it. Certainly not this year Eliza! I like the framings on this one! Another beautiful bouquet, Eliza. And now I know what kind of mallow I have. BTW, some of your comments on my blog wound up in spam for some reason. I rescued them last night. So if I did not respond to a comment, it was because I had not seen it! You’re the 3rd person to tell me this! Since WP updated their comment page, I have a feeling that there are glitches in the program. Hopefully, it won’t happen again, but it is a good reminder to periodically check my spam folder, too. Beautiful! You really have an artful eye! So inspiring Eliza! I love your combinations … Which always have a special tweak! What a beautiful arrangement, not to mention the fact that all this came from your garden. Lovely. Thank you, M. I could probably supply a few florists with all that is out there right now. High summer! We don’t have many flowers planted (but the fruit is going gangbusters). Thank you so much for your kind compliment and sharing your memories. Flowers do make the house so much more cheerful, don’t they? Thanks so much, my dear. I didn’t see Cathy’s post until after I posted mine so I could insert my link. My spouse does express appreciation for my efforts and at times, helps out with the heavy stuff. After 25 years, there isn’t much in the yard that I haven’t had a hand in. In totality, it is quite amazing when I think about it! I love your flower arrangements. They are beautiful :). This is the best one! I chuckle because that is what a little boy said about the fireworks each time and then there was a real showstopper and the whole crowd said, “No, THAT was the best one!” I love the cone flower center of attention in this arrangement. Thank you, Kathy. That is funny about the little boy. Speaks of the wonderful way children view the world. We could take a page from their book! such a pretty arrangement, Eliza. I love the Echinacea (mine has yet to flower!) with the softness of the Bracken Fern. such a pretty arrangement, Eliza. 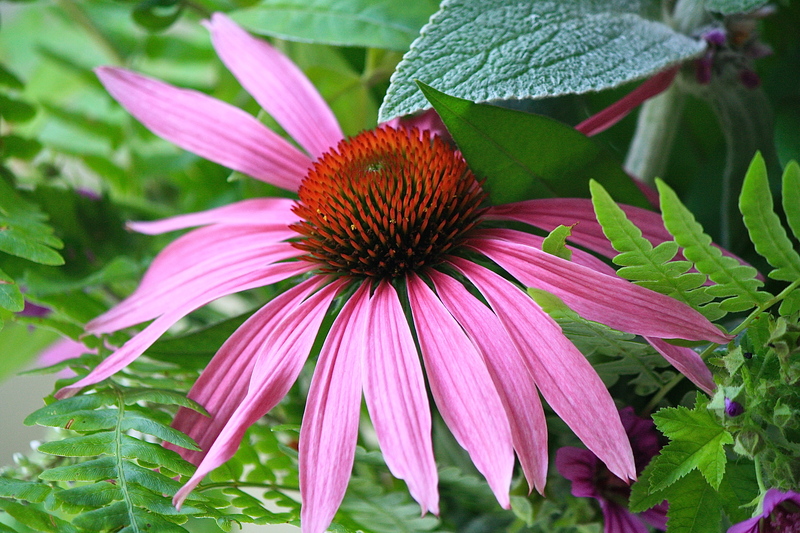 I love the Echinacea (mine has yet to flower!) with the softness of the Bracken Fern. (Please ignore my first comment – I am having trouble commenting from my new blog!). Beautiful flowers, arrangement and images!